Wickle is a gift & toiletries company founded in the UK in 2004 by illustrator Scott Wotherspoon and cosmetics expert Elisabeth Henrikse. Chestnut & Vetiver is one of the line's four fragrances (the others are Muskmallow, Periwinkle and Scented Tea Leaf) and features notes of toasted chestnut, woods, warm amber, musk and vetiver. The idea of toasted nuts over earthy vetiver immediately called to mind Hermès Vetiver Tonka, but they are nothing alike. Chestnut & Vetiver is a simpler and fresher fragrance, without the deep rich notes of the Hermès. It is mildly sweet, with a bit of warmth from the amber, and a touch of indistinct florals mingling with the chestnut. The vetiver is not quite as pronounced as I would have hoped — it is lightly earthy at most — but it is a fun fragrance, and very wearable. If you found Vetiver Tonka to be too much, it might be just what you're looking for. Wickle apparently repackages their fragrances on a regular basis; the current packaging (shown above) features a "simple pure silver silhouette pendant" by jeweller Takako Copeland. Chesnut & Vetiver is £39.50 for a 50 ml bottle of Eau de Parfum at ticklemywickle, where you can also find a list of retailers. A bath & body oil is also available and is currently on markdown at £4.75. Anthousa is best known for their line of home fragrances. They released a trio of personal scents this year, including Citrus Sorbet and White Tuberose. Fig & Vetiver has notes of green fig, bergamot, mandarin, cyclamen, fresh berry, peach, osmanthus, rosewood, vetiver and black amber. I adore both fig and vetiver, so was very much looking forward to trying this new release. It starts out promising, with green fig and fresh citrus notes, and I liked the first 15 minutes very much. After that it takes off in a different direction: sweet fruits over blended floral notes, with the fig itself rather subdued until late in the game after the heart notes have faded. There is a touch of vetiver & woods, but you will have to go looking for it — I don't know that I would have guessed there was vetiver at all if it wasn't in the fragrance name. If you are looking for a fruity floral with fig, it is worth a try, but it isn't even close to the deep earthy fig I was hoping for. 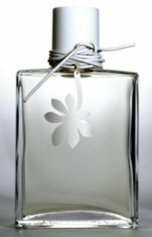 A 50 ml bottle of Anthousa Fig & Vetiver is $75, and is available at aedes, beautyhabit or your-cosmetics. I seriously love that wickle thing. I'm normally not a fan of vetiver, but when it is done well, like in VT and this one, I just can't keep my nose off the thing! I was not impressed with either one of these. I guess that Vetiver Tonka is still my favourite vetiver (along with Guerlain, Etro and FM). Chestnut & Vetiver is yummy stuff, so simple and easy to wear too, as you said. I was curious about the other one but it doesn't sound like something I'd love. More, more vetiver reviews, please! The Wickle one sounds cute. I don't know if I will seek it out, but if I stumble upon it, I certainly will try it. Drat — still have to try that Etro. The others are better than the Wickle, although as I said above the comparison is perhaps unfair — this is a less serious perfume. M, I don't think you would love the Anthousa. Napa Valley Cielo, for that matter, is a better done fig-floral. I just like to say wickle. LOL — it is a great name. Ooh, sounds interesting! Caribou Coffee makes a chestnut coffee every fall that's to die for. I wouldn't wear it though. My favorite vetiver is still Provence Santé Vetyver. Its drydown is dusty-spicy dry, not sour like so many vetivers. And at $27 for 100ml, it's a steal. Well, I think the Wickle must be the vetiver for folks who don't like vetiver so much, based on the above comments and my reaction. If you're serious about your vetiver, it isn't going to do it. I thought it was delicious, though. K, I have not tried the Provence Sante (not sure I've tried anything by them but the Linden), but it sounds lovely & will have to look for it.